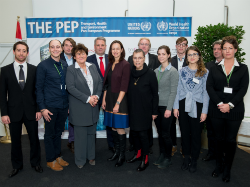 Austrian Ministers, WHO, UNECE and youth delegates at the sixth meeting of the European Environment and Health Task Force in Vienna, Austria. Over 70 young people from 33 countries in the WHO European Region gathered in Vienna, Austria, on 27–28 November 2016 to have their say on the future of environment and health policies in Europe. The event was held at the invitation of the Government of Austria, to prepare for the upcoming Sixth Ministerial Conference on Environment and Health. The European Environment and Health Process is an international policy platform that has brought together ministries of health and environment of the 53 Member States in the WHO European Region since 1989 to address environmental and health challenges through intersectoral policies. The Process is co-led by WHO and the United Nations Economic Commission for Europe (UNECE). Since 2004 the Environment and Health Process has been engaging young people in the protection of their future health. Through its sustained commitment to youth engagement, the Process supported the establishment in 2014 of the European Environment and Health Youth Coalition (EEHYC), a new international nongovernmental organization that gives a voice to young people, promotes their understanding of the links between environment and health and advocates youth participation in decision-making processes in these fields. “We must ensure that young people are fully engaged in decisions on environment and health policies that affect their lives and those of the future generations,” said Dr Zsuzsanna Jakab, WHO Regional Director for Europe, at the International Youth Conference on Environment, Health and Mobility, organized by EEHYC. “We need to strengthen youth involvement in the process by activating youth groups, implementing youth-led watchdog mechanisms and creating volunteer and work opportunities in environment and health for young people,” added Dovilė Adamonytė, Vice President of EEHYC. During the Youth Conference she noted that only about a quarter of Member States in the WHO European Region have reported youth engagement in the Environment and Health Process. Conference participants elaborated and collectively endorsed the Youth Position Paper on Environment and Health, including a Youth Commitment to Act, with suggestions on strengthening the involvement of youth representatives in decision-making and how young people can help to implement environment and health activities. Through the Parma Declaration on Environment and Health, adopted at the Fifth Ministerial Conference on Environment and Health in 2010, Member States in the WHO European Region are committed to involving young people in policy formulation and the implementation of environment and health objectives. Strengthening youth engagement remains an important priority in the run-up towards the next Ministerial Conference. Input from the International Youth Conference on Environment, Health and Mobility will feed into the Ministerial Declaration on Environment and Health and its implementation plan. These will be adopted by the Sixth Ministerial Conference on Environment and Health, to be held on 13–15 June 2017 in Ostrava, at the invitation of the Czech Republic. The Conference will bring together health and environment ministers and high-level representatives of WHO European Member States, partner organizations, academia and civil society. Member States are also expected to adopt a reformed governance mechanism for the European Environment and Health Process during the Conference.